I uttered the word so unexpectedly that Louise almost spilled her Cape Coddah. 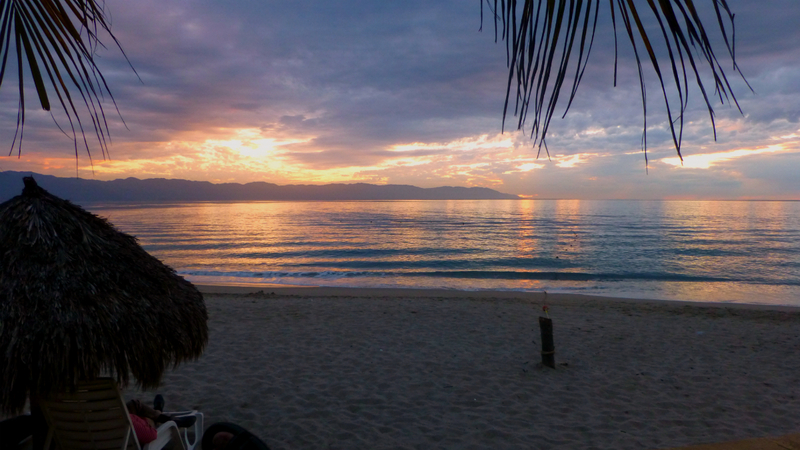 Visions of a thick filet over a charcoal fire almost surpassed the vision currently upon us of sunset over Banderas Bay (pictured above — another episode of sunset guilt). “As in this very moment?” Louise asked. But she needn’t: I was already on my way. And so it was that we embarked on another brisk walk to the Brazilian steakhouse up the road, home of the most sumptuous filets in the land. It’s a long walk — about 35 minutes — but it does wonders for the appetite. The fire pit at La CaipIrinha. 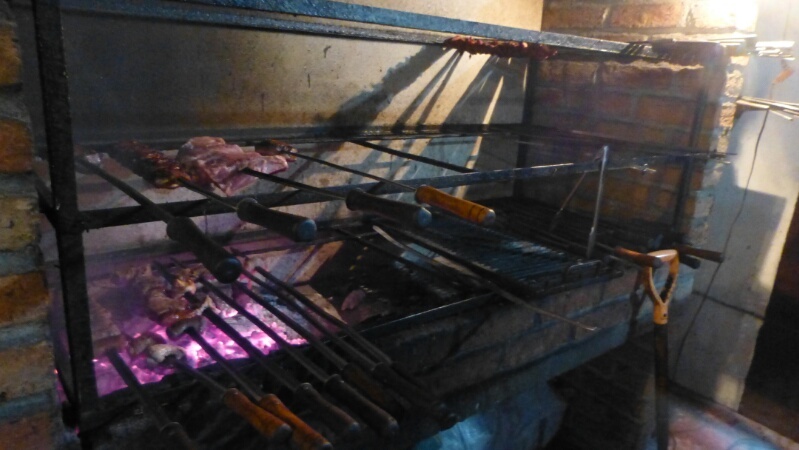 We ordered La Parrillada Brasiliena (Brazilian grill), consisting of two filets, two thick sirloins, two chorizos, four Castilla BBQ ribs, two chicken wings, pierna de puerco (pork shoulder), picanha (beef rump), frijoles (refried beans), arroz (Mexican rice), sauteed onions with chiles, potato salad, red cabbage coleslaw (we asked for the recipe), tortilla chips, and three dips. Whew! The cost? 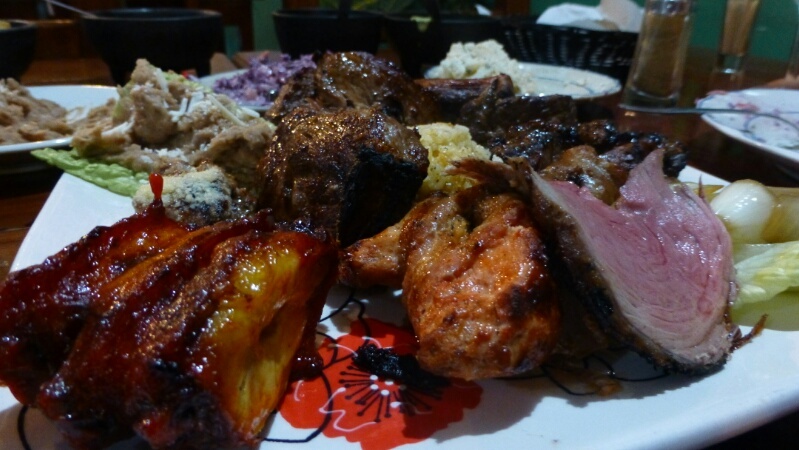 Two hundred fifty pesos (less than twenty American dollars) — for two. After the meal we stood on the street (with a bag of leftovers in hand, enough for two more meals) chatting with the proprietor (who told us he gets his beef from Canada) while we waited for a passing cab. (A thirty-five minute walk after all that food? Not likely.) 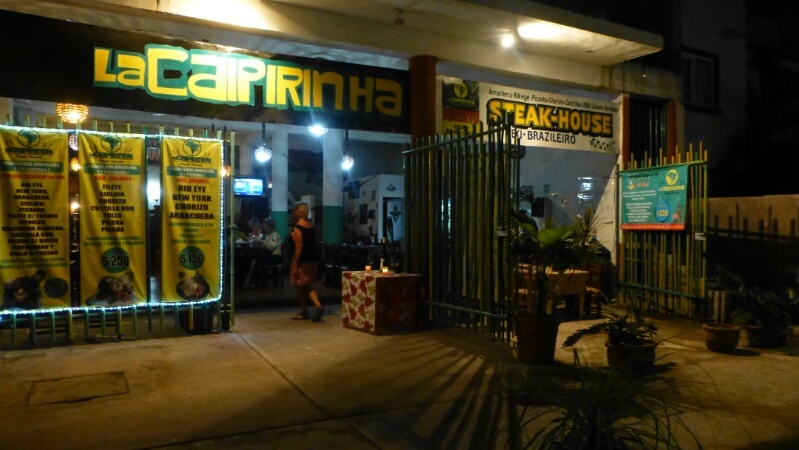 We’ve been to La Caipirinha many times; we vow to return every time we’re there. …vary quantities according to taste and let sit for at least an hour. Serve with inch-thick Canadian beef filets and plenty of good company. As I was reading, I thought, “I am asking for the recipe”. And then there it was. We have a beautiful, sunny day in Kansas! It’s going to be in the 50s today (not typical I hear). I enjoy your posts. They are definitely helping get through the dreary last half of winter – when the first snowfall is doesn’t even bring a slight smile. Thanks For the comment Linda! No quantities were given, but that’s half the fun of a dish like this: experimentation. Especially the dressing: just keep mixing and tasting. When you’re done, you have a dish you know you’re gonna love. I recommend the video – great music although the English needs a bit of editing. I agree, Marcia. The video captures the character of the place, but nothing captures the taste. Sounds like a fun evening and leftovers to look forward to. We had a steak moment last week as well, BUT, you had a way better meal and deal. Gotta love it when you find these local joints – they’re the best! This one looks like a “keeper”…… Thank you for sharing info about it, and especially for the recipe. I’m on a hunt for a local fish joint I’ve heard about that we’re hoping to visit in Dubai during an upcoming trip.